Two of the most formidable entities in commercial boating have combined once again to deliver the latest vessel for Marine Rescue NSW. Yanmar and Steber International have delivered the first of four new rescue vessels, with unit number one headed to Batemans Bay. Designated by Marine Rescue NSW as BM30, the boat will be on hand to patrol the Bateman’s Bay region and perform rescue work when called on by the boating public or NSW Water Police. Batemans Bay on the south coast of NSW is home to a large game fishing group and an even bigger trailer boat community. BM30 is a Steber 38 built to stringent survey specifications. While the limit of operations for Marine Rescue NSW is 15nm offshore, the Steber 38 is accredited for work 30nm offshore. The Steber 38 is an award winning hull design. The hull is noted for its exceptional sea going qualities and excellent handling features such as high speed level planning, excellent cornering, and dry soft riding and with good all-round vision. As a commercial boat supplied to Marine Rescue NSW, the fit out specification has been very specific yet utilitarian. When called on to work in unkind sea conditions and undertake dangerous work where there are lives at stake, there can be no short cuts in quality or equipment. The cockpit is exceptionally functional and can be sealed from the elements to keep water and wind outside under the most adverse of sea conditions. Naturally the cockpit carries a plethora of radio communication equipment, the best in navigation gear plus some creature comforts for the crew on board to endure long days and nights at sea. Throughout the boat, there are hand holds everywhere. The aft cockpit is dominated by a giant and secure towing post which sits squarely amidships between two flush mounted engine hatches. It’s under the cockpit floor that the real heart of the Steber lies. A pair of Yanmar 6LY3-STP engines with Yanmar’s own KMH61A marine transmissions is professionally installed in true Stebercraft fashion which facilitates easy maintenance and long life. The purpose built marine engine design of the Yanmar 6LY3 engine series and their renowned low fuel consumption are key factors behind their success as a proven light duty commercial engine. Low fuel consumption & servicing costs along with high reliability are critical factors not only when at sea undertaking a lengthy search, but also to help contain the operating costs of Marine Rescue NSW. Yanmar’s 6LY3-STP engine is a turbocharged, direct injected, intercooled, 24 valve, in-line 6 cylinder displacing 5813cm3 to produce 440mhp (324 kW) at 3300rpm. Weighing in at only 718kilos complete with Yanmar’s purpose built marine transmission, the 6LY3-STP delivers industry leading power-to-weight Yanmar diesel performance. The Yanmar 6LY3 features a high-technology electronic control system that governs all engine operations from fuel management to twin engine synchronisation, gear shifting and diagnostics. The intelligent electronic control system on the 6LY3-STP manages the fuel delivery system and injection timing of the high pressure fuel pump to dramatically increase torque, improve fuel economy, reduce noise at idle and particularly reduce fuel odour and white smoke at start up in cold conditions. Translated to on-water performance, the twin Yanmar 6LY3-STP powered Steber 38 achieved a top speed of 32.6 knots at WOT of 3357 RPM. Throttling back to a more realistic cruise speed of 21.6 knots, the Yanmars tick over at 2437 RPM with fuel consumption recorded at 40.5 litres per hour per engine. The boat is fitted with a pair of 23” x 26.5” props. 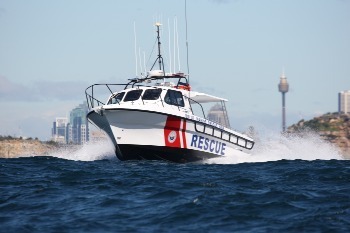 According to Glenn Finniss, Commissioner of Marine Rescue NSW, the Steber 38 was selected as much for its proven capability as much as it is also the vessel selected by many other public organisations. Power Equipment is the exclusive and authorized Australian, New Zealand, Papua New Guinea and South Pacific Distributor of Yanmar Marine and Industrial diesel engines importing product from Yanmar plants in Japan, Asia, USA and Europe. Power Equipment is also the exclusive authorized Distributor of JCB DieselMax engines for Australia, New Zealand, Papua New Guinea and the South Pacific. Power Equipment also distribute the Yanmar powered MASE diesel marine generators range and Gori high quality folding sailboat propellers.